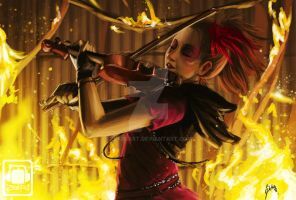 A Photo Manipulation of Lindsey Stirling. The Credits for the background and the Original photograph goes to its respective original artists/photographers. a little more darker in the foot area and a little bit more shadow it would be better. That is really very awesome!! This is epic! Wish had a tutorial. Love this! And kudos to the original artists/photographers! 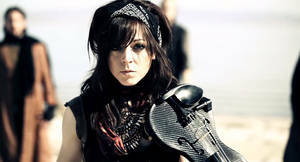 Btw, what is your favorite Lindsey Stirling song? Just curious. whose the original artist of the background? omg she's actually open in another window right now! I'm playing my fav song by her. This is so awesome! I love it! You did a really good job making her appear part of the backround as well. Did u paint the background? I just got home after seeing her show. She's incredible! That amount of energy and charisma coming off one person leaves you feeling awed. Go see her! Nice manipulation, very true to the adventurous spirit of this talented artist! Haha, this is soo awesome! anyone else start thinking of "Moon Trance" when they saw this?